Angell’s Dentistry now offers the innovative GLO Science Teeth Whitening System for patients looking for an efficient, comfortable way to whiten their teeth. GLO stands for guided light optics. 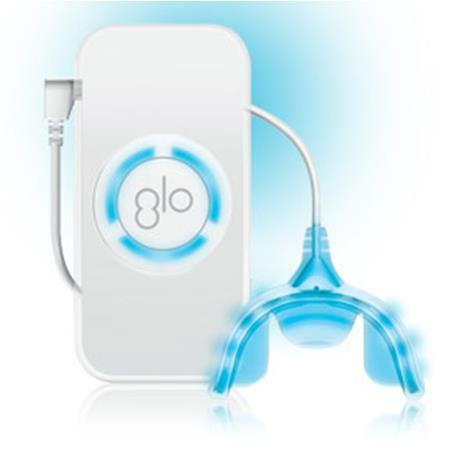 The GLO system uses a gel whitening mixture and a gentle LED light to lighten tooth enamel. The whitening gel is designed to adhere to the teeth without getting on gums and other soft tissue. After it is applied to the teeth, a unique, closed-system mouthpiece is placed in the mouth, activating the gel and lightening the tooth enamel. The mouthpiece prevents whitening oxygens from escaping the tooth surface and bombards stains, making the whitening process more effective and more efficient. Patients start using the GLO system with an in-office professional whitening session. We will then give you a take-home kit that includes a mouthpiece housing the LED lights and heat resistors and whitening gel. The take-home kit can be used throughout the day and can be used for up to two months. For quality results without the consultation of a Dentist, GLO Science provides at-home whitening solutions. With the GLO whitening system, patients can achieve whiten teeth by an average of five tooth shades lighter, and without the painful “zingers” commonly associated with other professional teeth whitening procedures. Call Angell’s Dentistry for a consultation about using the GLO Science Whitening System. Dr. Douglas Angell and our staff are committed to helping you keep your mouth healthy. And be sure to visit our website at: www.angellsdentistry.com. This entry was posted in Angell's Dentistry, cosmetic dentistry, Dr. Douglas Angell, find a dentist Birmingham MI, find a dentist Michigan, find a dentist Troy MI, local dentists Troy MI, tooth whitening. Bookmark the permalink.